Hang notes, papers, and more on your fridge with our personalized rectangular magnets. Keep them for yourself, use them as stocking stuffers during Christmas, or give them out at the office. Although they are small they will make a huge impact when their personalized and you've chosen the designs and colors of your liking!! A few sheets of paper can fit underneath the magnet and you can wipe them down with water and cloth if they get soiled. 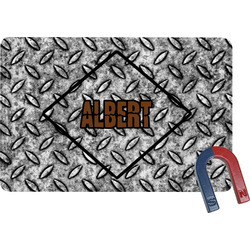 The great part about these magnets is that you can use them on any magnetic surface you like!! This is super cute but a little smaller than expected. My daughter really likes it, it hangs on her locker.